Unfortunately, I'm a little late with this one. But better late than never, am I right? NGHBRS (pronounced Neighbors) are filling the void Envy on The Coast left in our lives. Even ex EOTC member Sal Bossio had nothing but nice things to say about these Long Island natives. They start off Hellomind with 'Bodies', a pop rock track with strong vocals from Ian Kenny. The rest of the band lays low for this track but pick up at the chorus. 'American Junk' has a bluesy vibe and Kenny accommodates his voice to fit the tone of the song. Tommy Fleischmann shines on this track and becomes one of the main focal points. Every track on this EP stands on its own and each band member has their moment to break through. On 'Drinking With Friends', bassist Eric Vivelo delivers quick and quirky riffs. Vivelo adds to the poppy sound of this track and it's party-esque lyrics; "My friends all need to drink/By the time the weekend comes/who needs to think?". NGHBRS slow it down with "Spoon Fed" and "Beautiful Birds". When I listen to "Spoon Fed" I can't help but to reminisce on the days when "Lapse" by EOTC was constantly playing. Kenny gives vocals eerily similar to Ryan Hunters as he plays a beautiful melody on the piano. The song is short but leaves a lasting impression and is packed with emotion. "Beautiful Birds" starts off nice and smooth before diving into another powerful chorus which now gives the drummer, Jordan Schneider, a chance to be heard. But it isn't long before Fleischmann pulls out yet another killer guitar solo. 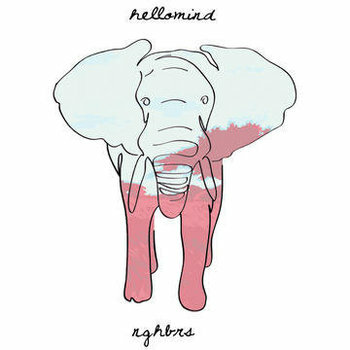 Hellomind is wrapped up with "Hallows". The only thing we hear differently on this track are some group vocals. "Hallows" falls short of the rest of the EP and earns its place at the end. It's safe to say NGHBRS will have no problem making themselves known after more people hear Hellomind. Heartbroken EOTC fans will mend their hearts with this familiar sounding EP and beg for more. You can download two tracks from their Facebook for free or purchase the entire EP here.